This page will introduce professional partition magic for Windows users to extend partition when Disk Management cannot extend volume. Disk partition is running on low disk space on your PC? Some Windows OS like Windows 7/8 and Windows Server has improved its Disk Management function with a better disk space management, which allows its users to extend disk volume. The problem is that the "Extend Volume" may be grayed out when you want to extend a volume. What is wrong? Well, in this situation, you can extend the disk volume by using a third-party partition magic which has no limitation to help you extend volume, shrink volume and move volume. Download, install and run IM-Magic Partition Resizer Server. 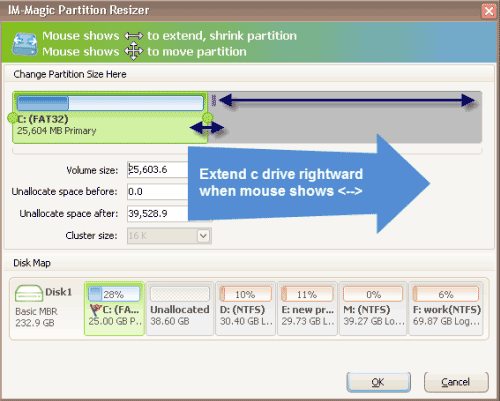 Right click partition that has available space and choose "Resize/Move" option. Shrink the selected partition and squeeze some unallocated space. "I have partitioned my Seagate hard disk into 4 partitions on my PC when installing the Windows Server 2003 operating system. 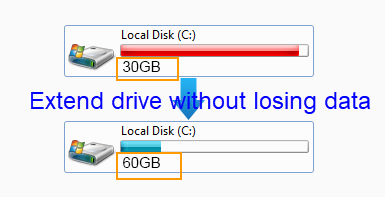 Unfortunately, I only allocated 20GB space to C drive and now I want to reallocate more space to it. However, after clicking C drive under Disk Management, there is no Extend Volume option. Is there any other way to extend Windows Server 2003 C drive?" "Extend Volume option is grayed out when I want to extend C drive space on Windows Server 2008 under Disk Management. There is about 30GB unallocated space which display behind D drive. How can I add the unallocated space to C drive on Windows Server 2008?" If there is no unallocated space, you can shrink other partition by selecting "Shrink Volume" option under Disk Management. Usually, you can extend C drive (system partition, primary partition, boot partition) and data volume under Disk Management on Windows 7, Windows 8, Windows Server 2008, Windows Server 2008 R2, Windows SBS 2008, Windows Server 2012, Windows Server 2012 R2 and more. If you cannot meet the requires mentioned above, the Disk Management will be unable to extend disk volume. In this situation, you can use IM-Magic Partition Resizer Server, with which you can squeeze unallocated space from other partitions. In addition, if the unallocated space is not contiguous to the volume you want to extend, you can move partition by using the software. With help of IM-Magic Partition Resizer Server, it is quite easy to extend C drive system partition and data partition without touching data stored on the drive. IM-Magic Partition Resizer Server is Server partition magic which can extend partition on Windows Server 2003, 2008, 2012, Windows Server 2003 R2, Windows SBS 2003, Windows Server 2008 R2, Windows SBS 2008, Windows Server 2012 R2 and Windows SBS 2012, etc. IM-Magic Partition Resizer Server can not olny expand volume on Windows Server, but also enables you to extend volume on Windows XP, Windows 7 and Windows 8, etc. If you want to extend volume on those Windows OS, you can also run IM-Magic Partition Resizer Free, which is free partition magic software to extend system partition and data partition without data loss. The partition magic provides safe and easy way to resize hard disk on PC without reinstalling system or repartitioning the hard disk. It supports all brands of hard disk to allow you to resize NTFS partition and FAT32 partition.